Salads are the ultimate meals when it comes to losing weight and living a healthy lifestyle, but sometimes they can be a little bland and boring after having them on a daily dieting schedule and the same old ingredients. So, to spice up a salad there are some ingredients that can be added for great taste without all of the calories and fat! One of those salads happens to be a spicy and zesty chicken curry and mango salad. Not only is it incredibly yummy, but also all of the ingredients are unbeatable for weight loss while boosting energy and being very filling. 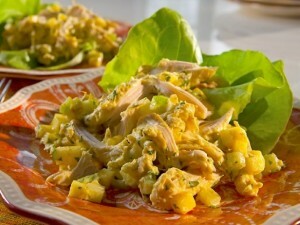 What kind of fat burning and healthy living benefits can you get from a chicken curry mango salad, anyway? A. Chicken curry is very healthy when skinless chicken is used on top of fresh chopped fruits and vegetables such as Granny Smith apples, celery, and an olive oil base is used instead of fattening butter. Oil is a great way to curb extra calories, as well as the curry seasoning itself. B. Leafy greens such as spinach or Boston lettuce added into salads can be a huge boost in energy instead of using iceberg lettuce so commonly used in salads. C. Mango is a fruit that helps with shedding those pounds instantly, on top of being very yummy. D. To top it all off, a vinaigrette dressing instead of a cream-based dressing on the salad will improve weight loss as well as promoting a healthy lifestyle with a light and filling meal. 1. Remove the skin from the chicken, and pull the chicken meat into 1-inch pieces with your fingers. 2. In a bowl add the yogurt, mayo, chutney, lime and/or lemon juice, and curry powder and stir. Then stir in the chicken, apple, celery, mango, and cilantro. 3. On a plate arrange the Boston lettuce leaves and spoon on the tasty chicken salad. This entry was posted in Weight Loss Recipes and tagged chicken curry recipe, healthy chicken recipe, healthy chicken salad, healthy recipe, weight loss recipe, Weight Loss Recipes by Jamie Eberle. Bookmark the permalink.